Attend any marketing or real-estate seminar and you are likely to hear a recurring theme – location, location, location – it’s all about the location. Whether you are in a New York City apartment or a farmhouse in the Canadian countryside, every location has its appeal and selling points. Finding the ideal location, however, a place to call home is really more a question of what you are looking for. So, when it came to defining the criteria of where to build a backcountry lodge, we drew not only upon our own personal experiences and adventures but, at the heart of it, what it was that made us fall in love with the backcountry in the first place. Ultimately, we wanted an area that was remote yet accessible, had a great mix of terrain, elevation and exposures, and was in a reliable snow-belt. With increased activity and access to the backcountry, however, along with growing environmental concerns and changing climates, finding the ideal location was reminiscent of finding the needle in the haystack. After years of scouring over topo maps and satellite images, we did however eventually find what we believe to be the perfect place. Every so often there are times in life that you visit a place for the first time and instantly it feels like home. Perhaps it was the time it took to find it or the spectacular views that our first flight in brought us nearly 15 years ago, but when we first stepped out of the helicopter and looked around we knew we had found something very special. 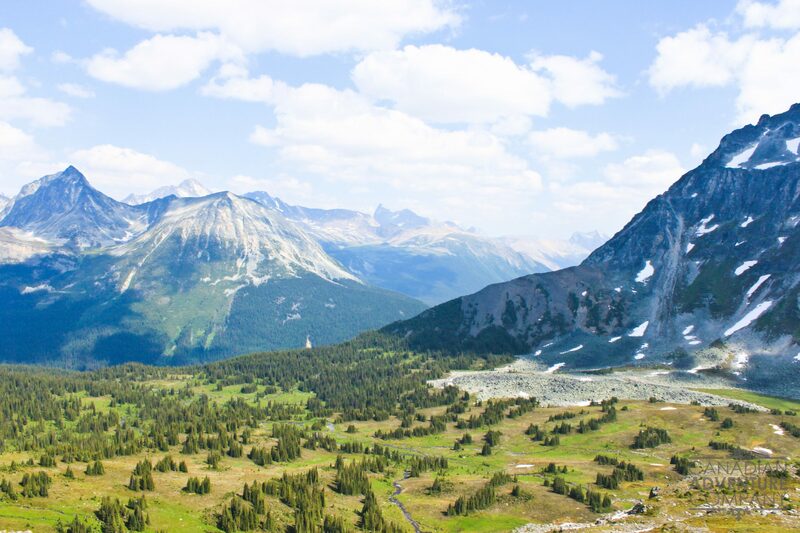 Deep in the British Columbia Rocky Mountains, bordered alongside Jasper National Park and the Alberta border, was a remote area removed from any development or signs of human activity. Covering over 5 valleys and with no road access, the area was completely tucked away in a truly untouched remote wilderness environment. Want to get a feeling for where we are, take a look at the lodge location from a satellite view here on Google Maps. With Mallard peak in the background, we spent the next few hours exploring the valley meadows just above where the lodge now sits. Needless to say, the excitement and awe of the area was overwhelming, but we were absolutely certain of two things. We were exploring somewhere very few people had ever been to before and, without question, we were home. We would eventually call it “Punchbowl”. At over 7600 hectares, Punchbowl covers a huge amount of land. Five side-by-side valleys offer up a vast variety of terrain from wide-open meadows, high-alpine ridges and bowls, to avalanche chutes and forested glades leading to the valley floor. Jagged peaks surround the landscape in all directions and ridge-lines soaring to over 8000 feet are easily accessible within a few hours from the lodge. At just under 6200 feet, Mallard Mountain Lodge sits in an ideal location to access a huge amount of terrain above and below the lodge, as well as into multiple adjacent valleys. Terrain varies from beginner to advanced and is easily and safely accessible in nearly all seasons and weather conditions. This was an extremely important consideration as we were searching for the ideal area, as it is crucial to ensuring every guest has the best experience possible. In the summer, hikes vary from a few hours to full 8 hour days and can often cover more ground than in the winter. 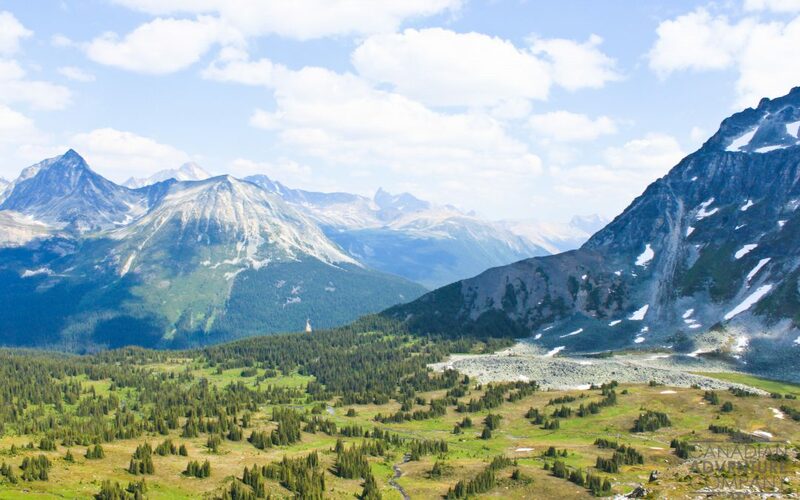 Trails from the lodge lead into open meadows filled with wildflowers, fauna, creeks, waterfalls and alpine lakes, and then up onto panoramic ridge-lines with spectacular views in all directions. Come winter the landscape dramatically changes as the entire area is blanketed under an average of 2 plus meters of snow. High alpine ridges lead down onto open bowls and chutes and then down onto gladed trees and avalanche paths to the valley bottom, with many runs descending over 1500 feet of vertical drop or more. As seasons and climates continue to change, many areas of the world are experiencing less than favourable snow conditions. From the beginning of our explorations, before the topic of climate change was as generally accepted or understood as it is now, we knew it was important to find a location that was in an area with a historically consistent and reliable snowpack. 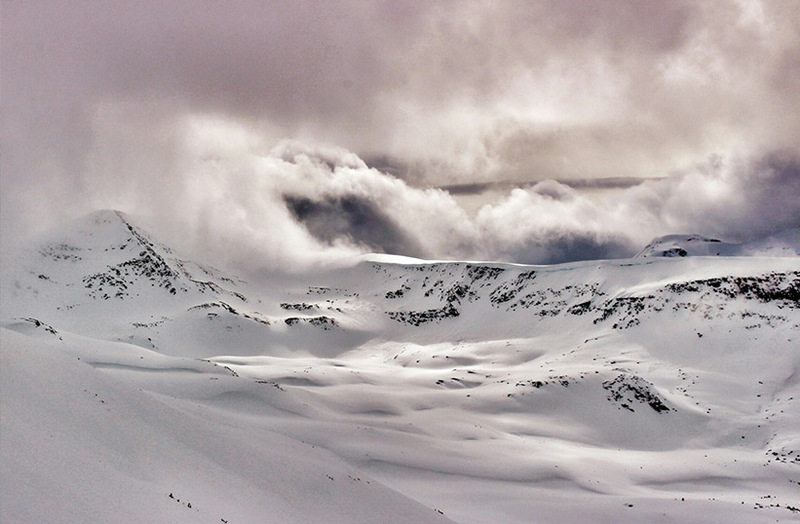 Situated east of the Monashee Mountain Range and north of the Selkirks, Punchbowl is in one of the most well known and sought after snowfall areas in the world. As weather systems from the Pacific move east and run into arctic cold masses from the north, they deliver a consistent supply of dry, deep powder. Additionally, being more northerly situated in the province, the area is less susceptible to warming and fluctuating temperatures throughout the winter season, providing for a more consistent base and better ski conditions all season long. Temperatures drop quickly in the fall, with the first dusting of snow by mid to late September. Winter dates run from late December to early May with an average accumulated snowfall of over 200 cm. Finding the ideal location was as much an exploration for a physical area as it was a search for a feeling from the past. The feeling that anyone who has ever been in the backcountry knows all too well, we call it coming home. Of course, we are obviously biased in our opinion but we do feel like we found a small piece of something very special and take no greater satisfaction than sharing it with our guests. We have a saying that “Every day is an adventure” – come, join us.